Been meaning to do it for ages, but have now finally FEA'd my chassis design. Am most pleased with the results, and if nothing else they show how good the balsa wood model method is if you don't have access to FEA software (though everyone does cos it's free! ), because that's what i used to design and optimise it in the first place. I'm using Grape, a free FEA tool that as far as i can tell can't model stressed panels - just the tubes. So my models are under-stiff as they have no panels. I also only have a tube defenition for 1.5mm wall RHS instead of 1.6mm 16swg. With these limitations the Book chassis comes in at just over 800 ft lb per degree as opposed to the known 1200 or so it is with panels and 16swg. I was pleased then that my chassis comes in at 4500 ft lb per degree with no panels . And amazed to find out how effective the removable over-the-engine-bay brace is! My engine is wide and mounted far back so I can't have either R tube in the engine bay. This is why i went for a structural scuttle and the removable brace (see photo archive). Without the brace fitted the stiffness is only about 1500 ft lb per degree! So that few kgs of structure trebbles the chassis stiffness by itself! Even with two R tubes (purely hypothetical in my case as they wont fit) my chassis is only 2400 ft lb per degree without the removable frame. Another significant point is the 'knee bars' that i've fitted from the outside of the cabin by your knees (where it starts to taper inwards) diagonally forwards to the middle of the inside of the footwell (see photo archive). When I was balsa modelling and fitted the engine bay frame the whole chassis became stiff apart from this kink in the chassis. I could see the sides flexing out significantly here on the balsa model so i fitted the 'knee bars' which stopped it. Sure enough the FEA shows that those two tubes alone add 800 ft lb per degree by themselves! It's worth pointing out though that without the engine bay frame fitted the chassis' wobbliness is irredeemable and these knee bars only add about 20 ft lb per degree - so only worth adding on a stiff chassis. Well just wanted to share that! With the panelling i'll be up around 5000 ft lb per degree which aint bad for an open roofed steel tube frame. And all this achieved with some simple balsa wood modelling - only verified by FEA. So have a go if you're doing something a bit different to the book and want to optimise your chassis (although that said, the FEA is actually less time consuming and less messy :p). Got any FEA images? Would be interested to see them. That's certainly one hell of a project build you've got there! Looking proper sweet bud! thats really interesting, clearly showing how much triangulation contributes. in an ideal world maybe a chassis should distribute stress more evenly, there seems to be a few redundant bits. here is the basic chasis for my delta integrale space frame chasis.. I am getting some very encouraging nubers, just need to check how accurate solidworks cosmos FEA is.. 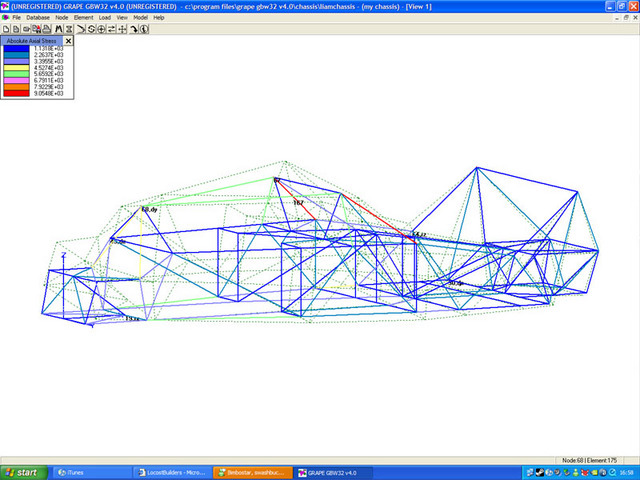 I've got sw 2005 and it wont let me stress my chassis as it's made from weldments which are all separate solid bodies. Does 2006 not have this limitation or is there a way to merge the weldments to one solid body? Or is that the full version of Cosmos with more features? (not just the cosmos express demo). My guess is it's the full version because he's using SW office premium which includes the full version. Please don't take this as criticism but your model appears to be over constrained compared to how this kind of thing is normally done. It looks like your chassis cannot change width at the constrained end. One constraint should be all the directions and the other rear corner only vertically and longitudinally. What you have done is still very useful to improve your chassis design but your constraints are artificially stiffening the chassis. 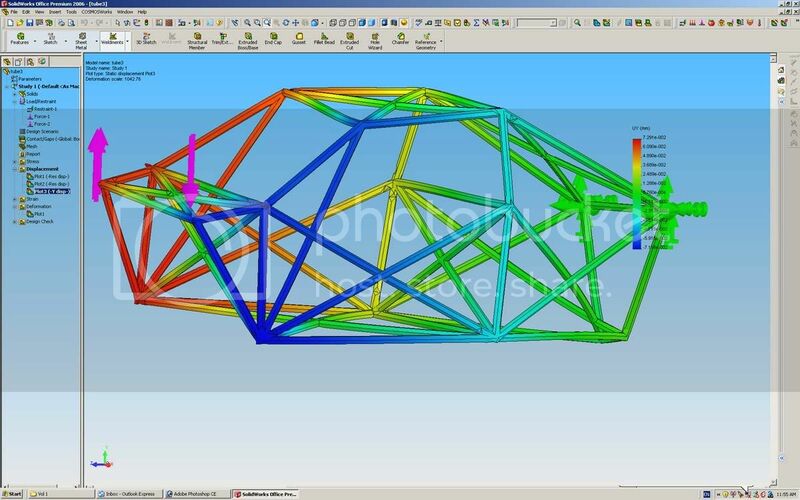 A useful way to determine how efficient a chassis design is it to carry out a modal analysis. I've no idea if Grape or Cosmos can do this type of analysis tho. The result you get is the natural frequency for different mode shapes (torsion, bending etc) and increases with increasing stiffness and decreasing mass. Again welcome to the nuthouse and please don't take this as criticism - I'm just trying to offer some useful advice. I think Express should work with the method I am using also..
hmm, if I find some time, I might even shoot a short vid clip on how to do it in solidworks... just the basics..
And amazed to find out how effective the removable over-the-engine-bay brace is! My engine is wide and mounted far back so I can't have either R tube in the engine bay. This is why i went for a structural scuttle and the removable brace (see photo archive). Without the brace fitted the stiffness is only about 1500 ft lb per degree! So that few kgs of structure trebbles the chassis stiffness by itself! Even with two R tubes (purely hypothetical in my case as they wont fit) my chassis is only 2400 ft lb per degree without the removable frame. Tube R is very, very, important though in your case you've replaced it with a substantial triangulated structure which is even more effective. If you miss it out then replace it with something else! Regarding the Knee bars I think they probably work in harmony with the rest of the dashborad structure, I don't think that the stiffness of the rest of the chassis is the real issue here. It's more likely that your dashboard framework is adding a giant triangular box across the chassis and the knee tubes triangulate one side of that box. Conversely, if there's no triangular box, or no loads being fed into the box by the engine bay top structure then the knee tubes do nothing much at all. The region behind the seat could be turned into an even bigger triangular tube across the chassis, you just need to add a couple of diagonals on the seat back and on the face at the rear of the chassis. Its so nice to read that somebody has played with a balsa wood model of their chassis to optomise it. Its amazing how much you can learn with just a few bits of wood! I don't mean to be critical but in my experience Cosmos and similar programs do not produce as accurate results as the obviously more pricey dedicated packages. Saying that they can provide information which is of course useful! In addition, to gain the most accurate results the element type needs to be selected with care. Modelling tubes with thicknesses can produce inaccuracies. I'm hoping to do some work in ANSYS soon. Nice work tho, nice to 'meet' people with the same interests. Keep us posted on any developments! The element type is less important than specifying the elements properties. At least at the locost level of modeling. As long as the properties are correctly chosen a beam, bar or strut should be fine for a spaceframe. The real reason that cheaper packages have a bad reputation, along with drawing package FEA plug in options, is that the operators don't have any real experience and think that you just point and click on the right buttons and off you go. It's very easy not to appreciate the maths behind the problem and how that relates to a real part. The operators have been told how easy FEA is so they blame the software for screwing up when the real problem is they haven't a clue. It takes years of experience to get really good at FEA and at the more senior levels a lot of hand editing of input decks and sometimes purely hand written decks are still carried out. Most of my input decks are a mixture of auto and manual mesh. I'm close to completing an analysis that has taken six months (a casting containing three bearings in which a shaft is mounted) and before that I spent six months looking at a spline and a nut (a very special nut to take very high loads with large load changes and severe thermals but still just a nut when all said and done). Then there are all the little things you need to know, Abaqus for contact, Nastran for structures and Ansys for non linear is a fairly traditional split of capabilities but then you need to know the difference between a beam orientation vector in one package and another. And do you want stiffness or stress or vibration? And they keep changing them too. Nastran changed a default on shell elements a while back. They don't tell you that on the typical two day FEA "instant expert" training course, they'll pretend it isn't true, but then the tutor has probably spent his entire career just pointing and clicking to fill nice simple shapes with tetrahedral elements. I've been on a Nastran course in which the tutor instantly appreciated why we used simple models for some very complex parts and complex models for some very simple parts but the UG stress package tutor had to have it explained to him that some problems are not best solved by pointing and clicking on the "fill with tets and forget" button. Having two problems with solidworks. Firstly, i can create the base of the chassis fine, sketch it, dimension it then convert to structural member in tube. I dont know how to draw in the other planes though, & how do I create tubes at compound angles? The other problem is as i make the chassis bigger, even with it all made as "combine" the COSMOS moans about the volume mesh failed??? Any pointers or a chassiss file I could open to play about with? 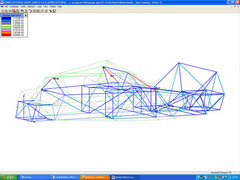 I generally create the whole chassis as a 3d sketch, constraining the line coincident, colinear and parallel etc. Doing it this way you avoid having to create planes to sketch on for nearly every chassis member. send me you email an I will send you a model as an example..
any luck on a video tutorial kikiturbo? I can create the whole chassis in 10mins in 3dsmax, but I've spent the last hour just trying to make a basic 3d shape in tube! !